Today I worked again with Davis Magnet School second graders as they selected photographs to include in their Davis on the Map final presentation. For those of you who are new to the blog, you can catch up on previous posts about Davis on the Map by clicking here. The teachers, Karen Jones and Beth West, contacted me earlier this week to suggest that I create a lesson in which I modeled the photo selection process. Does this photograph help us tell the story? Is this photograph interesting? Does it include shapes? Lines? Colors? Faces? Designs? Emotions? Is this photograph in focus? too light? too dark? If there are people in this photograph, are they focused on what they are doing? Does this photograph work well with the the photographs taken by others in my group? It was fun to see the students clicking through their individual photo galleries and to talk with them about how they were making their selections. I gave each student a piece of paper about the size of an index card and asked that each student choose three photographs from his/her gallery. Then, I assembled the group around each student’s computer and we talked about the positives and negatives of each photo. Ultimately, I asked the photographer to make the final choice. The photographer put a check next to the chosen photograph on the card (each had noted the photographs by number) and the teacher created a new folder for copies of the selected images. 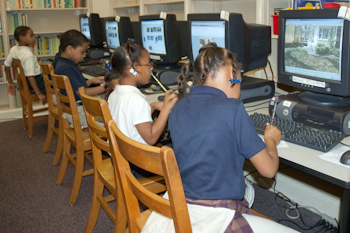 The teachers had to work hard to get the images into folders labeled with each child’s name; there were several technical issues to overcome because we wanted the students to be able to access the images from a common network drive and we wanted six students working together at the same time. This meant we had to use a bank of computers in the library. There were problems transferring photos from the two newer cameras to the computers, but the librarian was able to figure out that problem. I worked with two groups today and I’ll work with the six more over the next two days. One group today was able to begin the next step in our process, writing captions, but another group did not have time. Even though today’s activity seemed entirely a practical step (without much strict academic content), the lesson met several visual arts objectives. The students learned to recognize dominant elements of art in art work; identified art that tells stories and expresses ideas and feelings; analyzed art while listening respectfully; articulated preferences in works of art; and exhibited respect for their own work as well as the works of others. As they continue the work on their captions, they’ll be using research and writing skills. True arts integration. Lovely how you break complex tasks down into clear steps by asking the right questions. What a fantastic teacher you are. I love what you are doing here. Sorry to repeat myself. These kids are so lucky. Think how great that would have been for you at their age. Thank you, both. We did this with eight groups. It worked very well with 5 or 6 students, but the one group that included 8 was a little crazy. With 5 or 6, we could all gather around one screen and talk about the final selections of each student.